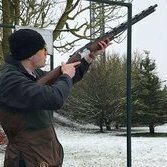 Woodlands wildlife, British birds, allotment, air gun shooting. Hi, I'm thinking about making a hamster for my HW 100 KT, I'll need to buy some threaded rod and long nuts, my problem is I don't know the thread pitch, on the stock bolts, that I'll be replacing with the rod. Can anyone tell me what the thread pitch on the HW100 stock bolt is? Cheers. Possibly eBay fees, cutting sellers profits ? Thanks for the quick replies,much obliged. Off to check eBay.🤓 Peter. Hi, I'm looking to buy scales to weigh my pellets. Advice or recommendation on suitable type, please. Peter. PS, I've just bought a Yukon xt 6.5x50 with a doubler, not fitted yet, need 11mm to Picatinny rail or 30mm scope rings 11mm dovetail mounts. Encouraging more rats /Magpies ,whatever to come in, lay down food in spot where you have clear sight of anything taking the bait, top it up regularly and wait for awhile and see what comes along once they are confident that it's safe. Not had an opportunity to take it out on a rifle yet. I, have taken it out using it as a spotting scope to look around my allotment after dark, spotted rats, fox, badger, The scope has a lot of potential, I like it. 🤔excuse my ignorance, I'm on a learning curve, what is this used for. 🤔 Not seen one before. Peter. Hi, I'm an air gun enthusiast, in East Sussex. How does a shooting syndicate work. ? and how does one join a syndicate ? regards, Peter. Thanks . this introduction was an edited version of my first attempt, which has the heading 'Hello' and I had a couple of conversations, on there. I'l need a little time to get used to this, as I have never done it before (as the actress said to the Bishop). All the best, peter. previous post should have read, ; There's NO PROBLEM FITTING A BIPOD. sorry ! PS, I've just bought a Yukon xt 6.5x50 with a doubler, not fitted yet, need 11mm to Picatinny rail or 30mm scope rings 11mm dovetail mounts. Encouraging more rats /Magpies ,whatever to come in, lay down food in spot where you have clear sight of anything taking the bait, top it up regularly and wait for awhile and see what comes along once they are confident that it's safe. The RM8 had the bipod on when I got it. There's problem fitting a bipod to the front forestock as it has a Picatinny rail ready to take an attachment. I was going to fit a bipod that clamps onto the barrel but it's now surplus to requirements. although it's as useful as the rail mounted one and very quick and easy to mount dismount I decided to go with the one already fitted. Photo's to demonstrate. For me, the real purpose of the tdr is discretion. the rifle packs into a case and, when the A A badge is removed just looks like a small case when carried by the handle or, it can be carried as a back pack using the detachable straps. I, can walk down the street and nobody even suspect I'm carrying a rifle (unloaded). That's the reason I, bought it.